When your hair is receding it can be difficult to know what to do. Many people feel embarrassed about it and, to make it worse, friends and relatives may tease you. Simply brushing your hair over it, however, doesn't always work. It can even leave the problem looking worse. So what can you do? Hair loss is like weight gain - we tend to notice it in ourselves, and start worrying, long before anybody else notices. Paying too much attention to it early on, as a result of worry, can lead to people noticing when they wouldn't otherwise. Instead of focusing on where your hairline used to be, think about how it compares to other people's, and how it fits with the shape of your face. You may find that a slight recession doesn't look bad. This is helpful because most styles that help to conceal receding hairlines won't conceal the whole of the difference. Trying to hide it all often looks more obviously artificial, and so gives the game away. The trick to hiding a receding hairline successfully is not to be too heavy-handed about it. Combing forward a large curtain of hair will lead to very obvious gaps when the hair parts. Using mousse or gel to try and fix your fringe in place is not a solution as its stiffness will then look unnatural. A better approach is to bring forward a smaller amount of hair cut in a layered or feathered way. Irregular cuts work much better than symmetrical ones because they cause the eye to be drawn to the longer strands of hair rather than to the places where hair is absent. This creates a kind of optical illusion. People can technically still see your high forehead, but they won't notice it. 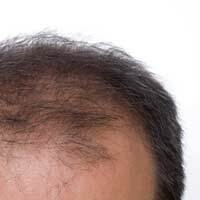 Many people find that they have fine, pale hairs of a reasonable length below the main part of their hairline, especially when it is receding. Carefully dyeing these can give the illusion that the main hairline is lower, but you'll need to be gentler with them than with the rest of your hair. A very short haircut may sound as if it would make a receding hairline obvious, but because it emphasises the shape of the head rather than the shape of the hair, this isn't always the case. It's especially effective if you have hair that is close in colour to your skin. With very short hair, the thinness of particular areas isn't as apparent, so thinning hair at the front of your head won't look bad. It's difficult to conceal a receding hairline if you have long hair, because people's eyes will be drawn to the contrast between the front and the back. If you really want to keep your long hair, wearing it in a pony tail tied low against the back of your neck is usually more flattering than keeping it loose, but don't draw it back tightly as this can strain the roots and cause your hairline to recede more quickly. If your hair is very curly, the usual methods of concealing a receding hairline may not work. Curly hair is often hard to draw in particular directions. The best bet is to opt for a short style that's layered so that the curls get shorter towards the front of your head, or to bring forward a few strands at one side and use a light gel to hold them in place. This won't hide your high forehead but it will create a distraction and draw attention down to your eyes. Sometimes trying to hide your hairline simply won't work for you, or you may become fed up of the feeling that it's something you're obliged to do. Why shouldn't you be proud of your natural appearance? Some people feel that a receding hairline can provide a dignified look which is flattering as they age. If your hair is receding in a widow's peak, brushing it backwards to reveal your temples can be very flattering. You can use your fingers and ordinary hair mousse to create a slight wave above your ears that will have the effect of enhancing your eyebrows and cheekbones and making the rest of your hair look thick and healthy. Spiking your hair can be another way of making a receding hairline look stylish, and is a particularly good choice for people who start to lose hair early in life. Just remember to be gentle with the hair at the front as it may have fragile roots.